I’ve always been fascinated by bees, and after my Costa Rica vacation this year, I learned so much more about bees after doing some tours. There was no way I was going to pass up an event held by the National Honey Board to hear more about bees. There were a few beekeepers I got to chat with, lots of food all made with honey. Mary Helen Leonard was demonstrating how to make honey body scrubs. And of course honey sampling done by Marie Simmons, author of Taste of Honey. After leaving the event with a full belly and carrying out a bag of SWAG, I decided to make use of the free cookbook from Marie Simmons. What a great book! It has almost 200 pages of cooking with honey. Breakfast, main dishes, salad and vegetable sides, and of course sweets! I decided to try my hand at a modified version of her honey and almond butter ice cream. It seems like I don’t do much of anything without chocolate being part of the mix. So I figured why not. Seems like this would be great with chocolate. I also added just a little bit of orange zest to the ingredients for a tiny bit of citrus. 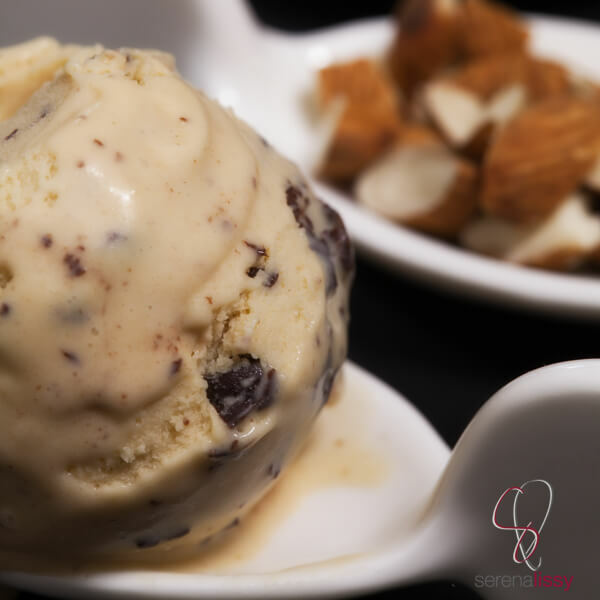 This ice cream has a rich almond flavor. I used smooth almond butter, but you could also use chunky if you prefer. The chocolate chunks gave the ice cream a much needed crunch that I was looking for. And since we are going a little bit decadent, I decided these would be best served in a brownie bowl. Why not, right?!? To make the brownie bowl, just grab a box of your favorite brownie mix, prepare according to instructions and cook in a muffin tin. Once you remove from the oven, take a second tin of the same size, spray the bottom of the pan with Pam, and place it on top of the hot one you just removed from the oven. (Be careful here; remember your first pan is fresh out of the oven and really hot!) Push down and you will see the brownies in the hot pan begin to form cups. Keep the second pan on until the brownies have cooled. Place milk, cream and zest in a heavy saucepan. Cook over low heat until simmering. Remove from heat and let rest for 3 minutes. Strain the ingredients out to remove the zest. Place milk, cream and egg yolks in a heavy saucepan. Slowly whisk to combine. Cook over low heat, stirring gently for 5-7 minutes, or until the milk is hot and it begins to coat the back of a spoon. Remove from heat. Process the chilled custard in an ice cream maker. When ice cream is about half way done, start drizzling the melted chocolate into the maker with the ice cream. Once completed per the manufacturers instructions, scoop the ice cream into a freezer container and freeze until ready to serve. It will keep for at least 2 weeks. Oh my goodness! This is the most amazing combo I’ve seen in a long time. 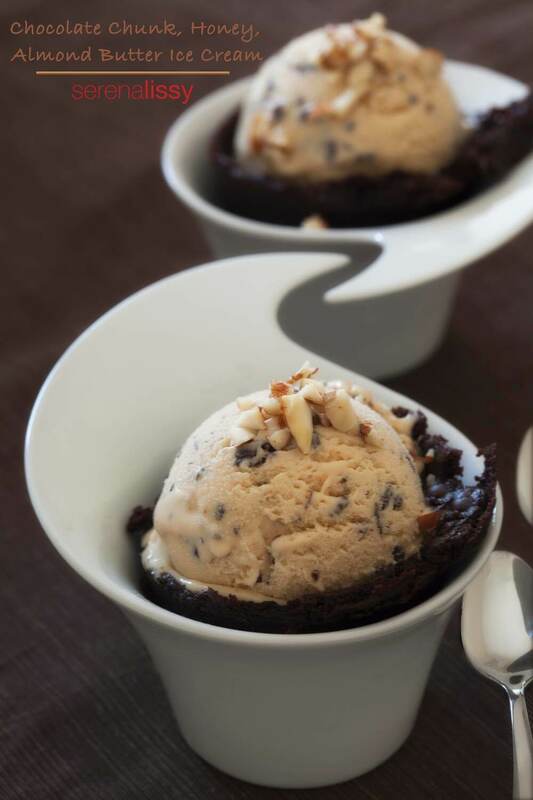 I can’t wait to try the ice cream and might make the brownie cups too! Thanks Laura, it’s a really great combo of flavors. The orange zest is easily increased or decreased depending on your desire for orange flavors. I used about double the amounts on this recipe and it was awesome with the brownie. I hope you enjoy it! Just got an ice cream maker for my birthday, I can’t wait to try this out!! Sounds amazing!